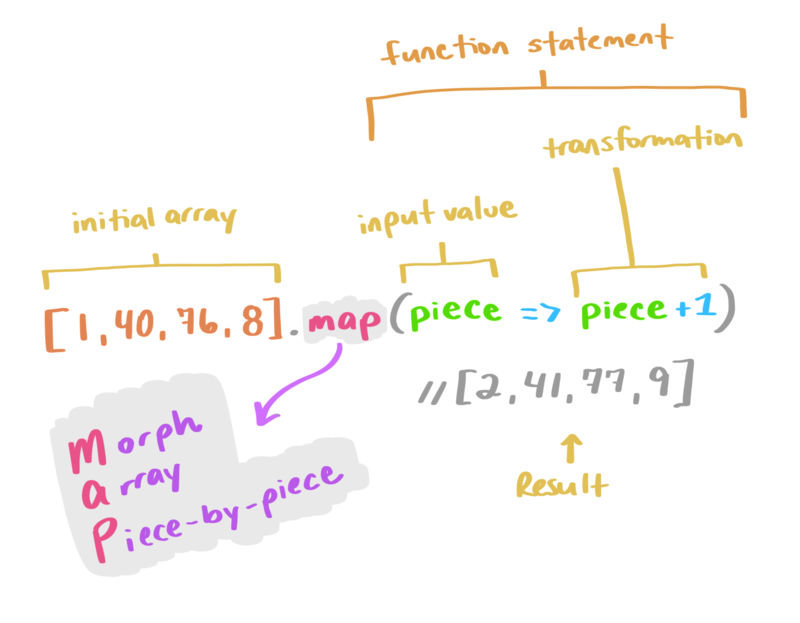 Array.map() updates each individual value in a given array based on a provided transformation and returns a new array of the same size. It accepts a callback function as an argument, which it uses to apply the transform. A mnemonic to remember this is MAP: Morph Array Piece-by-Piece. In the above example, we take an initial array ([1, 4, 6, 14, 32, 78]) and map each value in it to be that value times ten (val * 10). The result is a new array with each value of the original array transformed by the equation: [10, 40, 60, 140, 320, 780]. 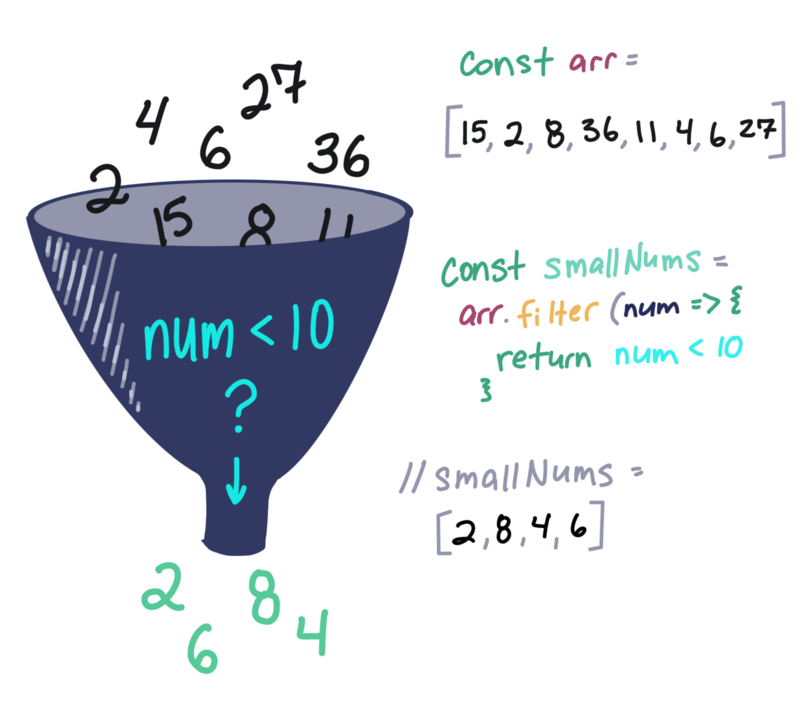 Array.filter() is a very handy shortcut when we have an array of values and want to filter those values into another array, where each value in the new array is a value that passes a specific test. This works like a search filter. We’re filtering out values that pass the parameters we provide. A filter, however, returns only the true values. So the result is smaller than the original array or the same size if all values pass a specific test. Think about filter like a strainer-type-of-filter. Some of the mix will pass through into the result, but some will be left behind and discarded. If the dogs get a score higher than 70 on their final test, they get a fancy certificate; and if they don’t, they’ll need to take the course again. In order to know how many certificates to print, we need to write a method that will return the dogs with passing grades. Instead of writing out a loop to test each object in the array, we can shorten our code with filter! 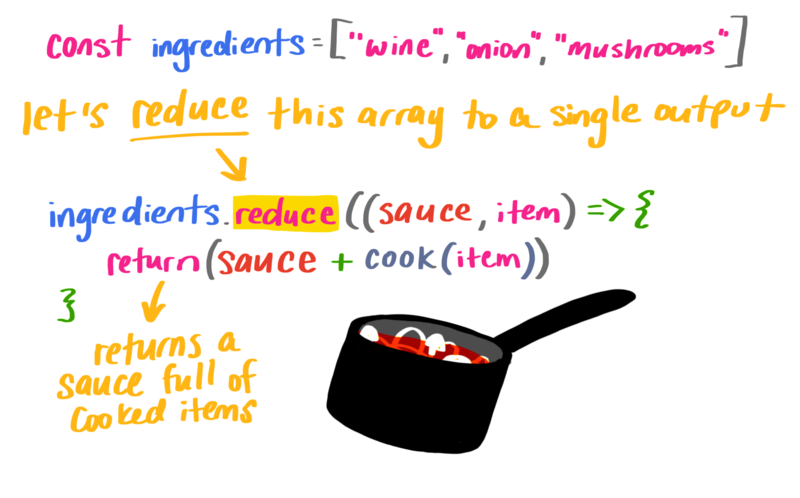 If we want to reduce the items into a sauce (pun absolutely intended), we’ll reduce them with reduce()! A little way to remember this is to recall how you make sauce: you reduce a few ingredients down to a single item.